Join us for culinary adventure through Andalusia, the land of the gypsies, flamenco dancers, flowered patios, acclaimed Iberian pigs (Jamón Ibérico and Jabugo), endless olive groves and ancient Moorish Palaces. Join renowned chefs for cooking lessons and markets visits, participate in tastings of the best hams in the world at award-winning farms and mills, visit UNESCO world heritage sites in Granada and Cordoba, stroll through the streets of beautiful white washed Andalusian villages, and end your trip with a private flamenco dancing and singing function. Depart on an overnight flight from your home country. 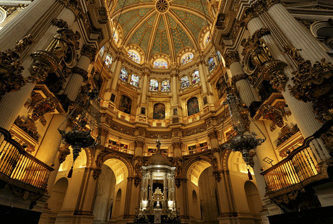 Arrive in Seville, the capital of Andalusia and the artistic and cultural capital of Southern Spain. Check into our beautiful and charming hotel located in the heart of Seville. In the evening, we will gather at a local restaurant for a welcome reception and a dinner based on Andalusian specialties. We will begin the day with a walking tour, exploring Seville’s historic center and its three notable monuments: The Cathedral of Santa Maria, the burial place for Christopher Columbus; the ancient Arabic minaret and symbol of the city; La Giralda, and the Royal Alcazar. After lunch on your own, we will gather for our first cooking lesson and dinner at one of the city’s best restaurants. Our culinary adventure in Andalusia continues 60 miles northwest of Seville in the Huelva Mountains, where, led by our leader, we will visit a prestigious family-run Iberian pig farm. Here we will see the process of raising the pigs and producing the famous Iberian (Jabugo) ham, one of the most important delicacies of the Spanish Gastronomy and the best hams in the world. We will have lunch in this beautiful property, and have the opportunity to taste these wonderful hams, along with other products from the Iberian pigs. Time permitting, we will visit the Ham Museum (Museo del Jamón) in Aracena. Dinner that evening is on your own. We will leave Seville in the morning with a stop on our way to Granada in one of the oldest cities in Spain. The millennial city of Ronda was declared a Site of Cultural Interest in 1966 and has one of the most beautiful historical centers of Spain. Here we will visit the wine cellars of a 16th century monastery, and later have lunch. After lunch we will continue our journey to Granada where we will check in to our 19th century hotel. Dinner that evening is on your own. After breakfast, we will head out to the second cooking lesson of our journey. We will join our chef on a visit to the local market to select and purchase the ingredients needed to prepare our full regional lunch. After lunch we have a guided visit of La Alhambra, the city’s 14th century iconic Moorish palace, which was declared a World Heritage Site by UNESCO. Dinner that evening will be in a wonderful restaurant with astonishing views of La Alhambra. As we leave Granada, we will travel towards the province of Cordoba. Along the way we will have the opportunity to visit olive oil country, including an olive mill for a tasting of different olive oils. Lunch will take place in Baena, famous for being Andalusia’s foremost producer of superb, high quality olive oil. Later we will check into our beautiful hotel in the exquisite white washed village of Zuheros. Dinner is on your own. After breakfast, we will head to an award winning olive oil mill for another great tasting experience. We will also witness the process of olive picking in the groves. After a guided visit of Priego’s Baroque art, which will include the 17th century Mayor de la Asunción Parish Church and the Church of La Aurora, among other monuments carefully selected for you, enjoy lunch on your own. The evening features our third cooking lesson, and dinner at our hotel. As we continue on our way, we leave the Cordoba Province and travel towards the city of Córdoba. On the way, we will stop in Montilla, world-renowned for its wines and endless grapevines, for a tasting of Sherry at local sherry cellars. Later we continue to Cordoba where, upon arrival, we will check into our charming hotel comprised of two 18th century mansions and a Mudejar-style courtyard. Lunch is on your own today, followed by a guided walking tour of the city center and the Mosque Cathedral, which is considered a world heritage site and one of the most accomplished monuments of the Umayyad Caliphate of Cordoba. That evening will feature our farewell dinner, including a traditional flamenco singing performance.